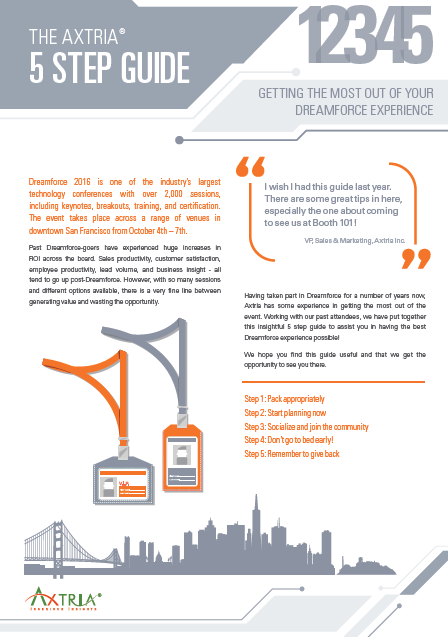 The Axtria 5-Step guide: Getting the most out of your Dreamforce Experience! Dreamforce 2016 is one of the industry’s largest technology conferences with over 2,000 sessions, including keynotes, breakouts, training, and certification. The event takes place across a range of venues indowntown San Francisco from October 4th – 7th. generating value and wasting the opportunity. Having taken part in Dreamforce for a number of years now, Axtria has some experience in getting the most out of the event. Working with our past attendees, we have put together this insightful 5 step guide to assist you in having the best Dreamforce experience possible! We hope you find this guide useful and that we get the opportunity to see you there. Step 4: Don’t go to bed early! Download the 5-Step guide to get the most out of your Dreamforce experience!